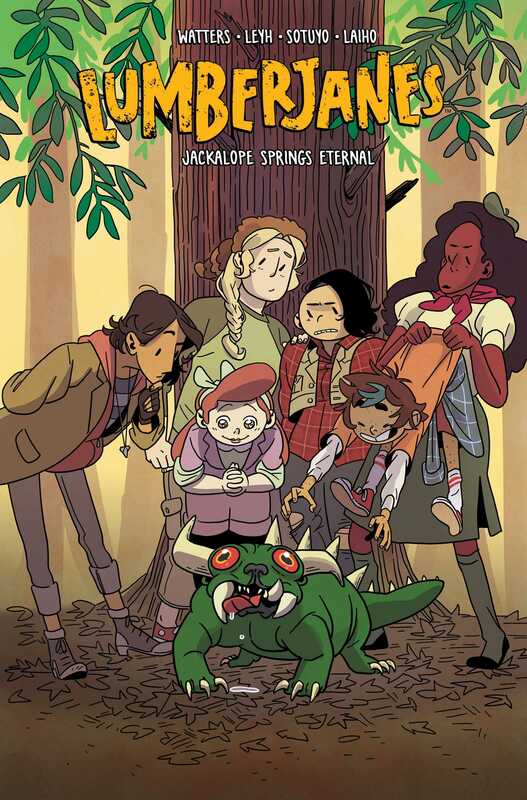 When Counselor Jen takes the Roanoke scouts on a mission to find a Jackalope, they end up stumbling on a young cowgirl who’s been living in the woods surrounding camp with her herd of unusual critters! In the aftermath of the time shenanigans set off by Jo’s Mysterious Time Thingy, the Roanoke scouts are a little bit uneasy on their feet. It’s up to Jen to cheer them up and help them get back up and off adventuring again, with a quest to seek out the most mysterious mythological monster of all…the mighty JACKALOPE! This New York Times bestseller and multiple Eisner Award and GLAAD Award-winning series features danger, adventure, and life-long friendships. Get in on the fun with this brand-new adventure written by Shannon Watters and Kat Leyh (Super Cakes) and illustrated by Ayme Sotuyo.